You’ve driven through the streets of your Woodstock neighborhood and noticed that each yard looks nearly the same. Sure there are a few yards that have something a little different, but nothing stands out and says, “Wow, that house has a beautiful yard!” If you are sick of the same old look as everyone else, consider customizing your landscape with a floriculture or hardscape addition from Woodstock based Hutcheson Horticultural Company. Our landscape designers know which plant and flower varieties will thrive in the greater north Georgia environment. They’ve also got a great eye for adding in a splash of color that will accent your home and make your yard pop. The summer months are a great time to add a hardscape addition to your yard. Many people enjoy extending their living area outside with brick or fieldstone fireplaces, or with one-of-a-kind grill islands. 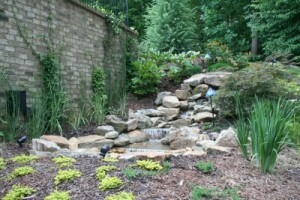 Others prefer the tranquil sounds of a custom made fountain or stream. With over twenty years of experience in landscaping, we’ve discovered that it is okay to be different! We love adding extra flair to the outdoor spaces for our clients. Contact us today so that we can share what we’ll do for you! Keep up with landscaping, hardscaping, and outdoor tips when you follow us on Facebook, Twitter, and Google +.